Attended with representatives from Come Let’s Eat Initiative, Embassy of Israel in Singapore, Burrple Singapore, Hazel Diary, Stormscape, Lirongs, and The 4 Moose. Budget about SGD $13 ++ per person. 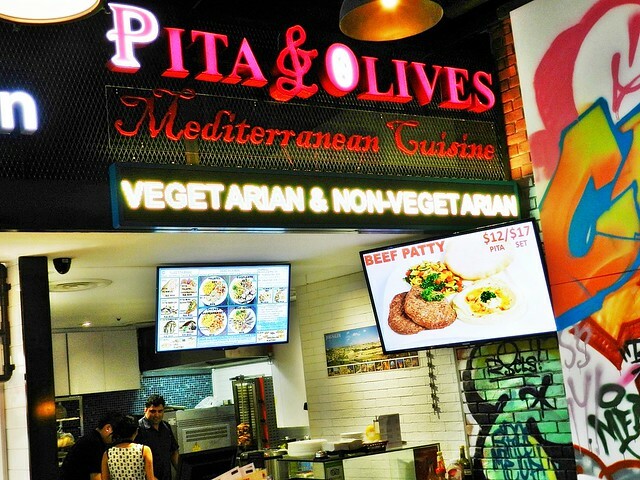 Originally opening in 100AM mall in Tanjong Pagar in 2013, Pita & Olives has since relocated to PasarBella in Suntec City as of 2015. 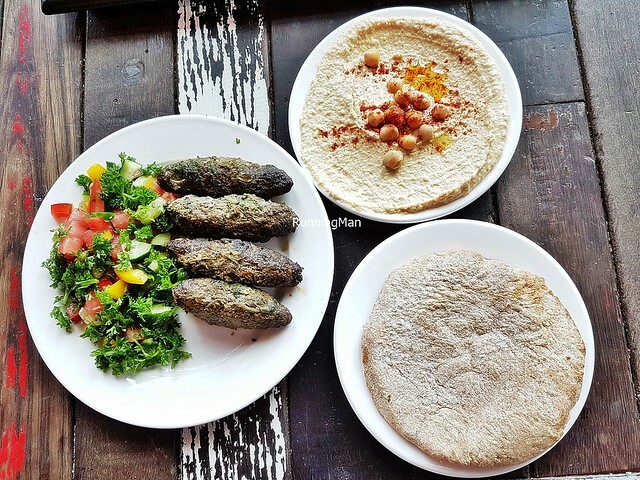 Known for their use of fresh ingredients and hearty, rustic, home made dishes, Pita & Olives offers a healthy, mostly vegetarian / vegan menu, with few meat options. 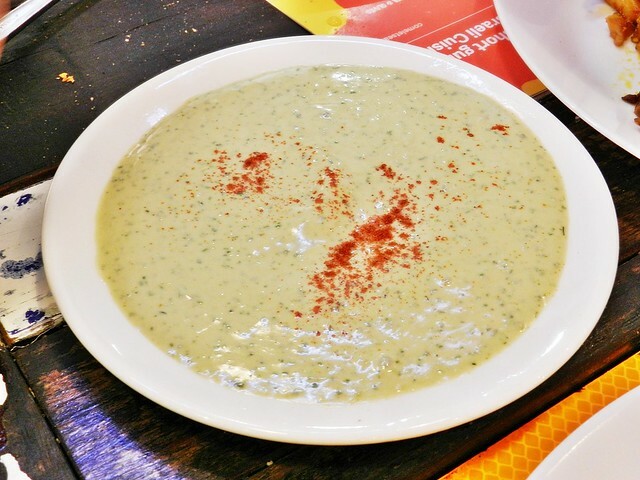 Their Israeli cuisine is very similar to that of other Mediterranean cuisines, such as Turkish cuisine or Lebanese cuisine. 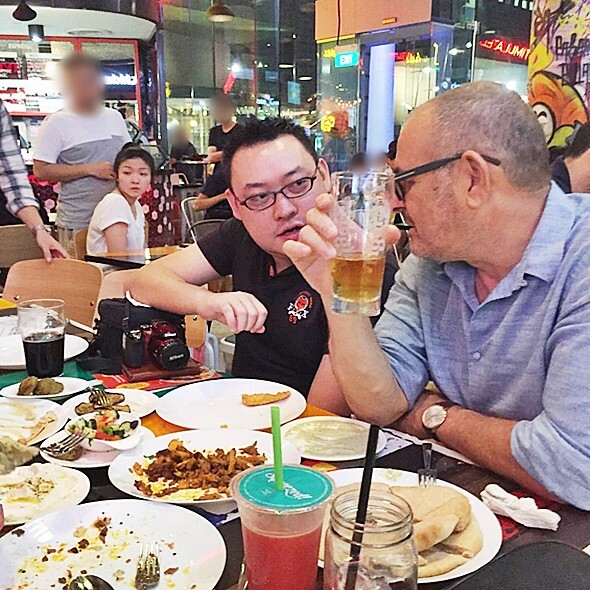 We attended as part of the Come Let’s Eat Initiative, which strives to promote a more harmonious society in Singapore, by connecting Singaporeans with foreign cultures, through a shared food experience. In this tasting session at Pita & Olives, we were fortunate to be hosted by representatives from the Embassy of Israel in Singapore, along with Head Chef Aviv. Ambience at Pita & Olives is minimal, really just a storefront at most. 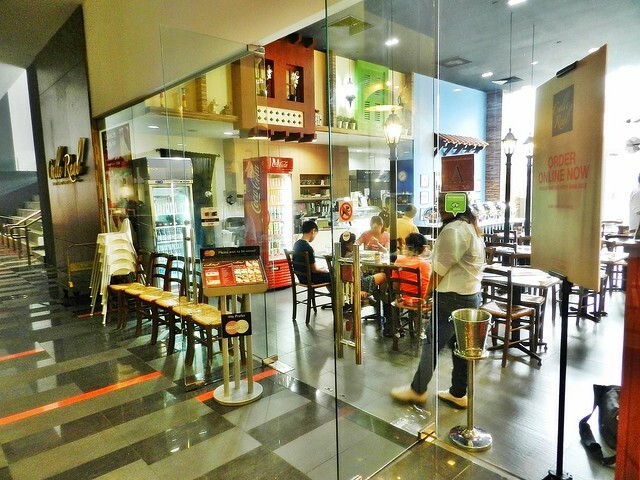 Located within PasarBella at Suntec City, it shares its seating space, furniture, and atmosphere with all the other stalls located here. The place is incredibly noisy, I nearly lost my voice several times speaking over the din. The furniture is also not too comfortable, being functional at best. What stands out for Pita & Olives is that they're located in a corner, so standing at the shopfront means you won't be blocking any people walking pass. 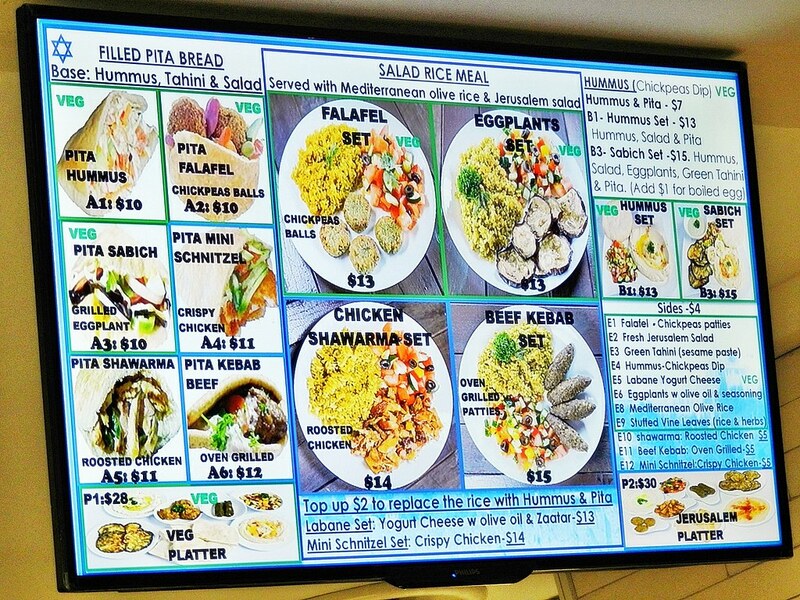 Service at Pita & Olives is partial self-service, with ordering and payment over the counter. However, if you sit around the store, staff will bring orders to your table. But if you sit further away, it's completely self-service. The menu at Pita & Olives is small, without any dish descriptions, but this is an opportunity for the staff to display their knowledge. They are able to describe the ingredients in dishes, as well as state how it's made. You can tell they're passionate about the food they serve. Good! Food at Pita & Olives is Israeli cuisine, which is almost similar to other Mediterranean cuisines, like Turkish cuisine or Lebanese cuisine. Food is simple, rustic, healthy, and wallet-friendly. Mostly vegetarian / vegan options, with very little choice of meat, I find eating here to be clean and healthy for the body. Dishes are tasty, and portion sizes can be finished by an individual, though sharing / communal dining of at least 2 people is recommended. Prices are affordable, possibly the cheapest store in the entire PasarBella, budget about SGD $13 per person for a full meal here. Chef is very proud of his Pita Bread (SGD $4), baking it fresh on-site daily. The difference is obvious, the texture of the bread is soft, warm, and fluffy, quite light with a slight chew. The small pocket is perfect for picking up food, and eating with your hands here isn't a problem. 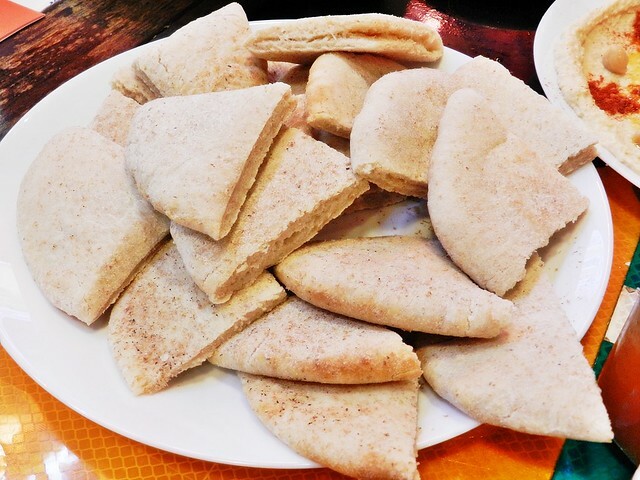 We ate so much pita bread during our visit! 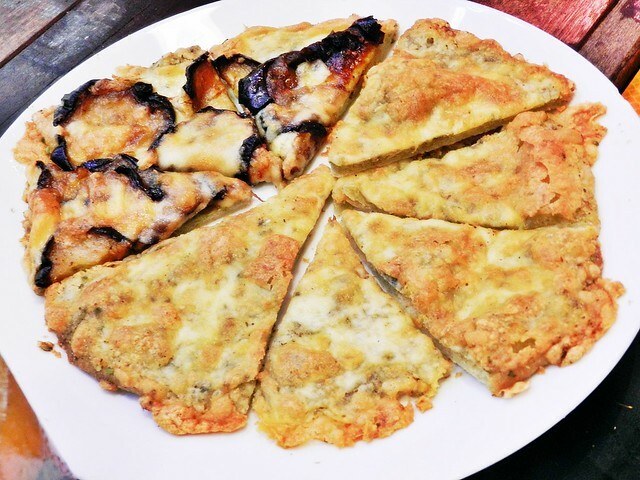 The newest item on the menu is the Zaatar Eggplant & Zaatar Cheese (SGD $8). 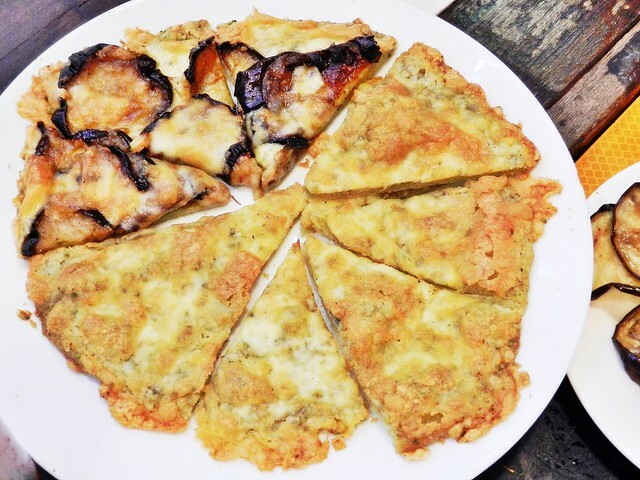 Think of it as an Israeli pizza, with a light, thin, chewy base, topped with either savoury salty roasted eggplants that have a smoky aroma, or sharp salty firm cheese that is big on flavour. Tasty! 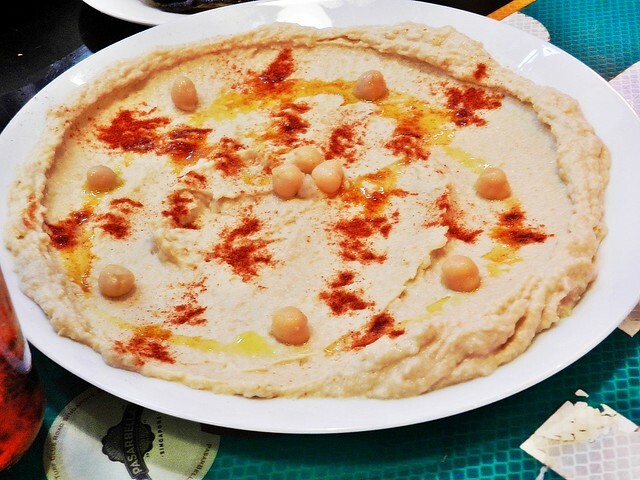 The signature dish here, their Hummus (SGD $4) is extremely tasty, among the best versions I've had! Texture of the mashed chickpeas paste is smooth and creamy, with rich chickpea flavour, yet isn't heavy or cloying. I wish I could spread it over everything! Highly recommended! 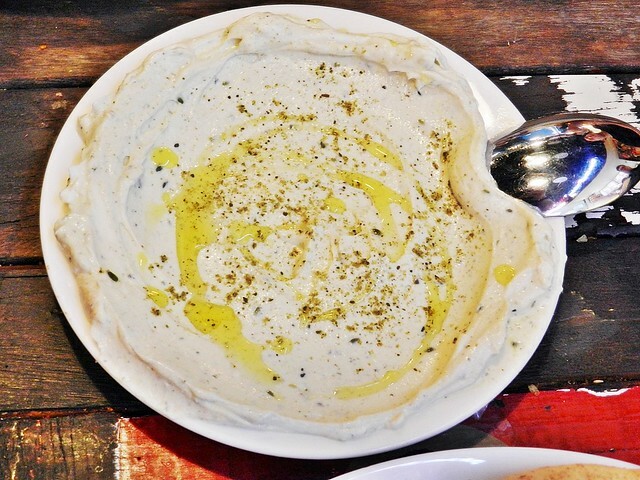 The Tahini (SGD $4) is a smooth, creamy, oily, mashed sesame seeds paste, served as a dip, and has a toasty, nutty, floral aroma and flavour. 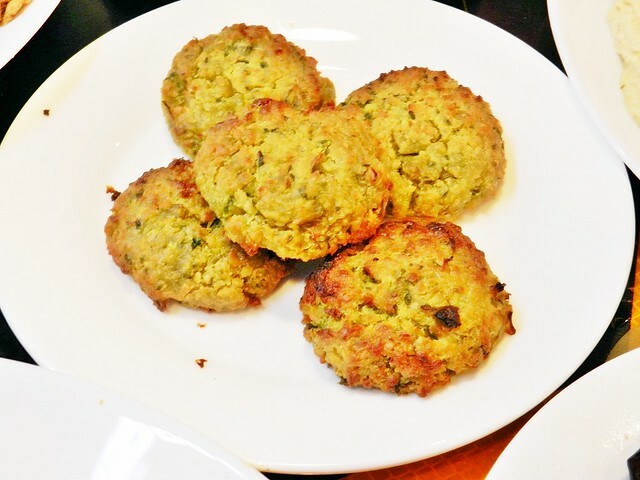 Our hosts from the Israeli Embassy tell us it tastes authentic, and that it's considered a staple in Israel, used as a dip, topping, or ingredient in many dishes, even in desserts! The Labane (SGD $4) is a type of strained yoghurt, sometimes also referred to as Yoghurt Cheese, or Greek Yoghurt. It has a thick, creamy texture, with a distinctive sour taste. It is a common street food in Israel, normally eaten with pita bread or zaatar, usually with a dash of olive oil. Personally, this didn't appeal to me. 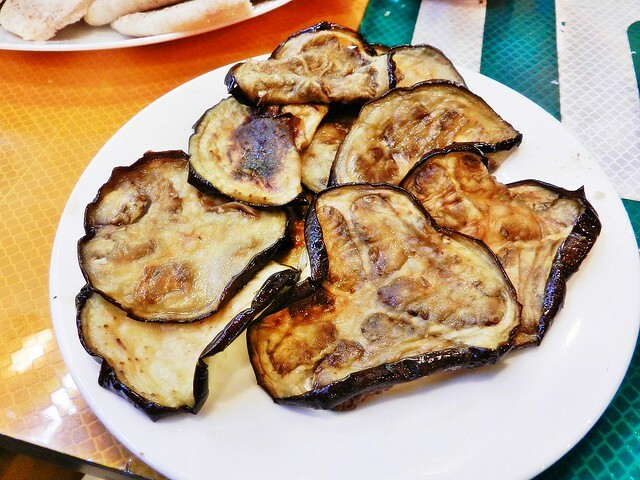 The Roasted Eggplant (SGD $4) features thin, tender slices of eggplant / aubergine, roasted till the exterior takes on a smoky aroma, while the interior remains moist. Taste is savoury salty, and our hosts tell us this is used as a stuffing / topping in pita bread. I find this actually lends good flavour when paired with other dishes! 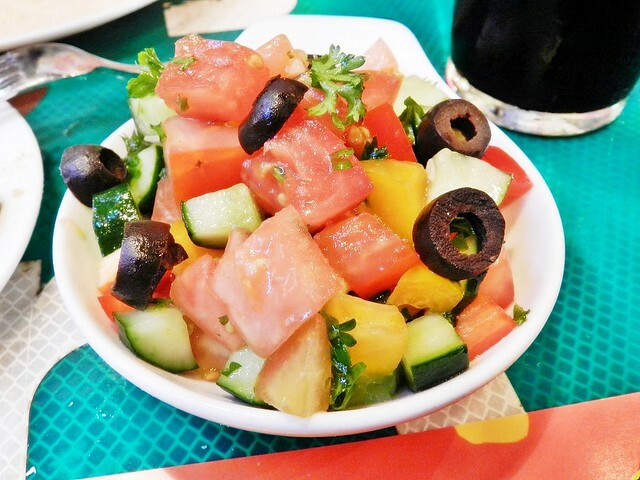 Yes, the traditional name is really Fresh Jerusalem Salad (SGD $4), and this clean, bright salad bowl features diced tomatoes, zucchini, black olives, mint leaves, lemon juice, vinegar, sea salt, pepper, and parsley. 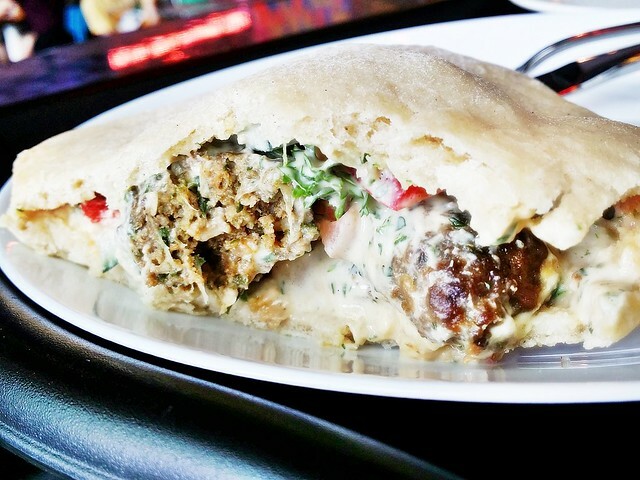 Fresh and healthy, it can be eaten on its own, or stuffed into the pita bread! 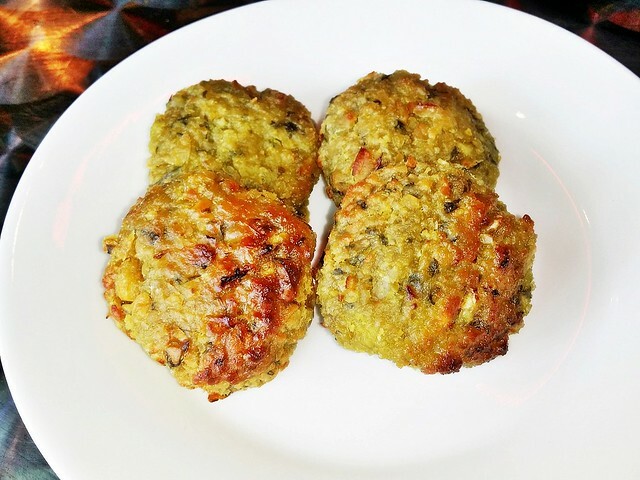 The Falafel (SGD $4), or ground chickpea fritters, was decent at best. What I like about this is the crumbly, grainy texture which lends itself well to chewing, and the fragrant smoked aroma, but the slightly dry texture tickles the throat, making it uncomfortable to swallow. 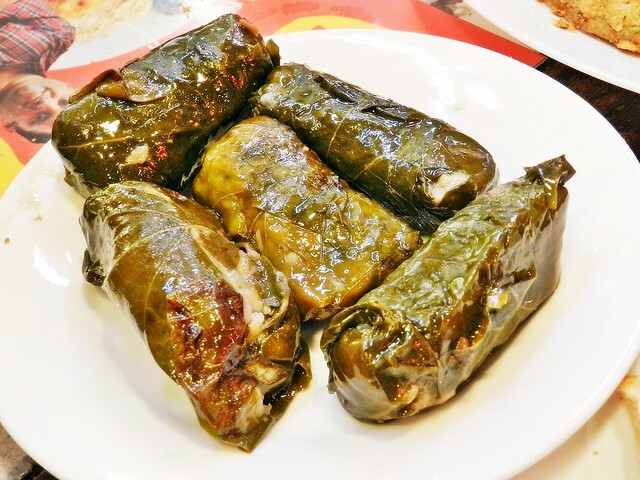 What the Turkish call Dolma, and the Greek call Dolmadakia, the Israeli people call Stuffed Vine Leaves (SGD $4), or Mahshi. The Jewish / Hebrew version differs slightly from others in Mediterranean cuisine, while it still has cooked rice stuffed into grape vine leaves, and rolled into a cylindrical shape, our hosts say that sometimes it can include other ingredients such as dried figs, dried apricots, or dried dates. The version served at the stall is the common, normal, plain version. 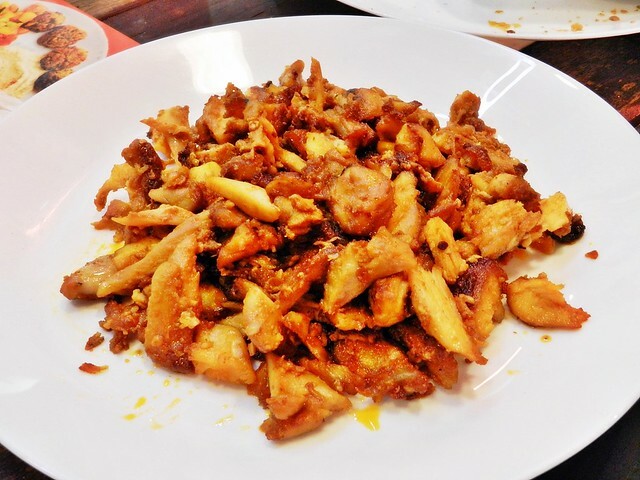 The Chicken Shawarma (SGD $5) here is savoury, with well marinated, thinly sliced strips of tender chicken meat. The spice coating lends moisture and flavour, and the meat has a fragrant, spicy and smoky aroma from the rotisserie grill. Good enough to eat on its own, this is best stuffed into pita bread, along with the other side dishes, and eaten together! 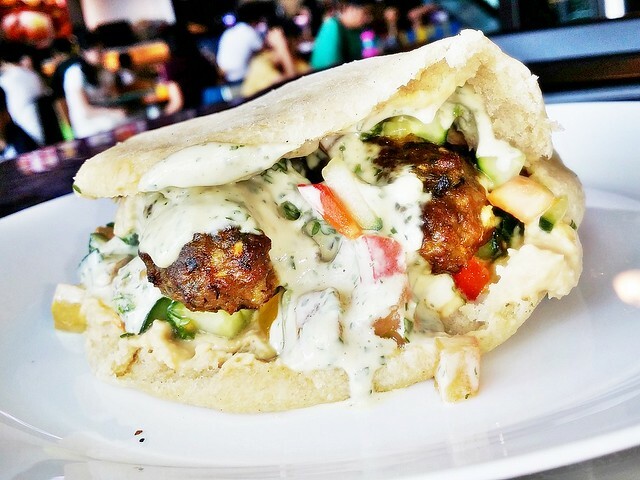 The Beef Kebab Pita (SGD $12) is a filling meal, featuring a warm pita bread, stuffed with hummus, tahini, diced cucumbers, diced tomatoes, and meaty savoury beef kebabs. The meat of the tightly packed beef kebabs have a fragrant smoky grilled aroma, while still being moist in texture. Good! The Beef Kebab Set (SGD $17) is a hearty, filling, healthy meal. Essentially, the ingredients are the same as the Beef Kebab Pita, but rather than being all packed together, this is the deconstructed version. Oddly, Jewish / Hebrew cuisine has adapted the Mini Chicken Schnitzel (SGD $5) from German cuisine. Our hosts tell us that this is especially popular with children, making a great finger food snack. But while the version here has tender chicken meat with a light, crisp, crumb batter, I find this to be possibly the least value for money dish on the menu. 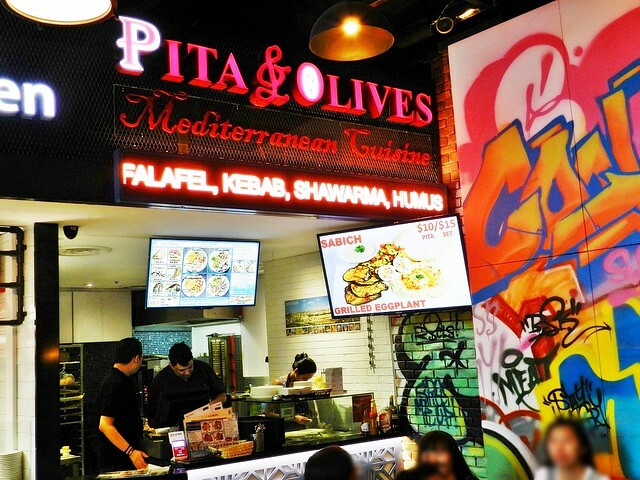 Overall, dining at Pita & Olives is an insight into the street food culture of Israel, and it's fitting that prices reflect the status of its common, daily diet of the people of the country. Healthy and light, yet tasty and delicious, Pita & Olives is suitable for everyday dining. Their set meals are value for money, and quite filling! Pity about the crowded place on weekends, I recommend visiting on weekdays instead. Spent about SGD $400 per person. 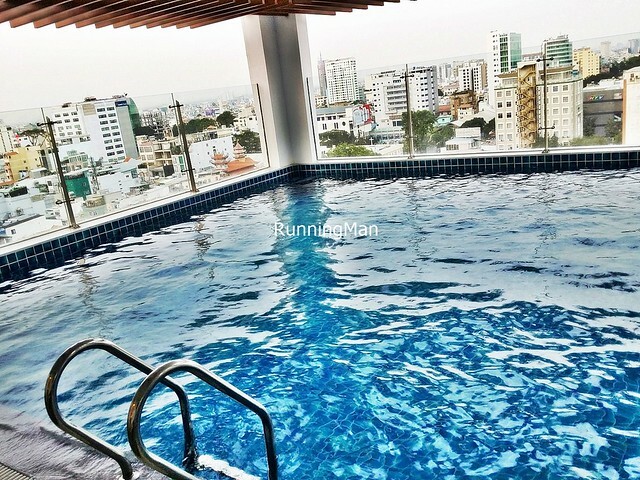 Located about 30 minutes drive away from the Tan Son Nhat International Airport in Ho Chi Minh City, Muong Thanh Saigon Hotel is a new, less than 1 year old, 4-star hotel conveniently located in the business district of the city. 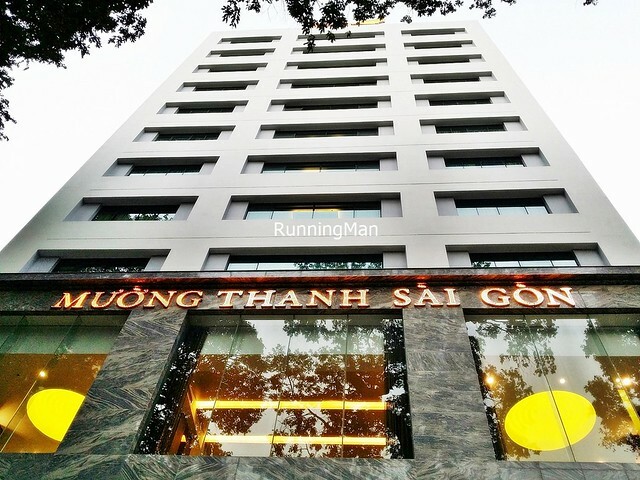 Having opened in September 2015, Muong Thanh Saigon Hotel boasts relaxing amenities for weary business travellers, along with convenience due to nearby restaurants, shopping malls, and offices. Ambience at Muong Thanh Saigon Hotel is clean and modern, but sorely let-down by decor which seems it's from the 90s. I like the high ceilings and ample natural lighting, lending a sense of space admist the brightly lit interior. 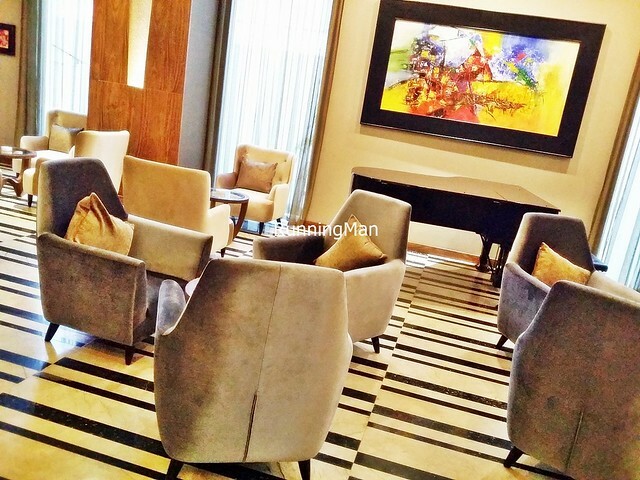 But the drab grey beige walls, tiles, and carpets make the place look old. The overall design of the place is also blocky and square, and the exterior looks plain and unassuming. 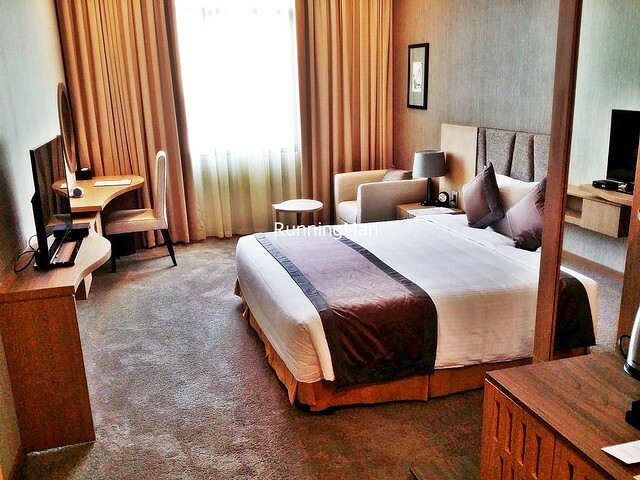 Rooms at Muong Thanh Saigon Hotel are clean, comfortable, and spacious. Nice! 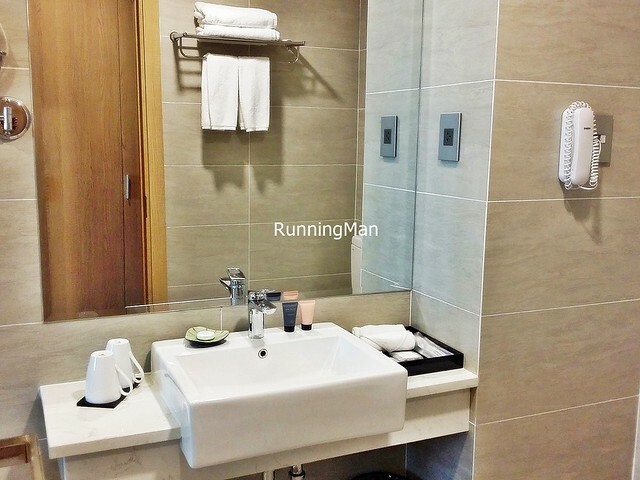 The beds are large and comfortable, and the attached bathroom is clean and modern, well-stocked with amenities. I also like the ample lighting, and the spacious working desk. 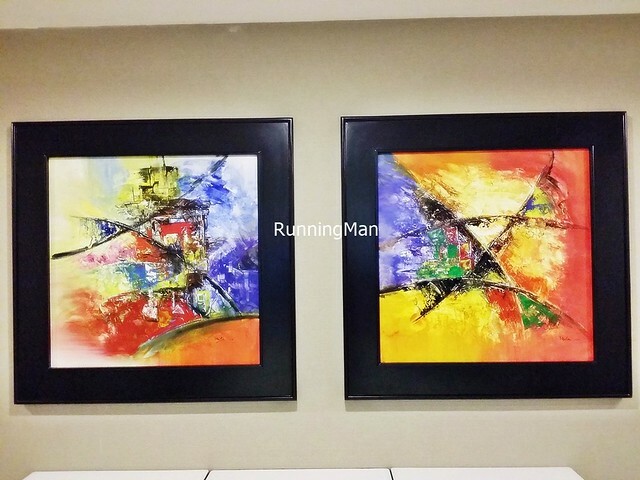 I only have 2 negative points about the room, the first is the lack of a cable television guide / instructions, it took me really long to figure out how to operate the remote controls, until I eventually had to call reception for assistance. The second is the lack of a soap holder within the shower, which means you either place the soap on the floor, or outside the shower. Food at Muong Thanh Saigon Hotel, in the Gia Dinh Restaurant, is terrible. There is an overall lack of variety, and most of the food available, are carbohydrates. Of the little food options here, most of the dishes are poorly executed, with unappealing tastes or textures. Taste is only passable at best for their noodle dishes. But I find it unacceptable that a 4 star hotel will only offer 2 soups, both which taste almost similar, and even look similar. The room service menu is also extremely limited, and is the smallest room service menu I've ever encountered in any hotel. You are better off eating elsewhere, in fact, there are excellent food options around the hotel. Service at Muong Thanh Saigon Hotel is good. Staff are able to converse decently in English, and work quickly and efficiently, even when handling large tour groups. They respond quickly to requests too. 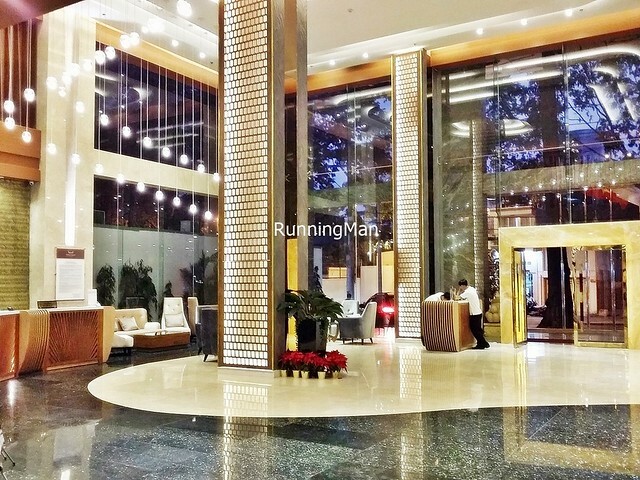 And while staff you meet in the hotel will offer greetings, I find the lack of a doorman somewhat lowers the experience, as it's odd to arrive at the hotel and not have assistance. Despite this, the service provided at Muong Thanh Saigon Hotel is good, and I will return because of it. 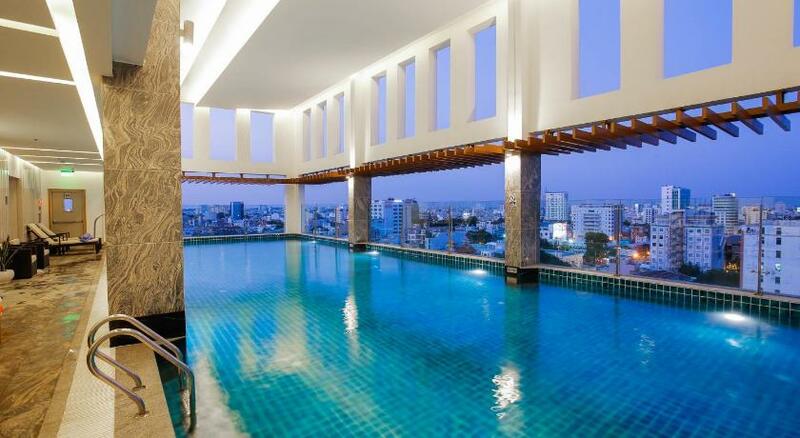 The facilities and activities at Muong Thanh Saigon Hotel are catered mainly to business travellers, though they also attract a large number of tour groups on account of being new. 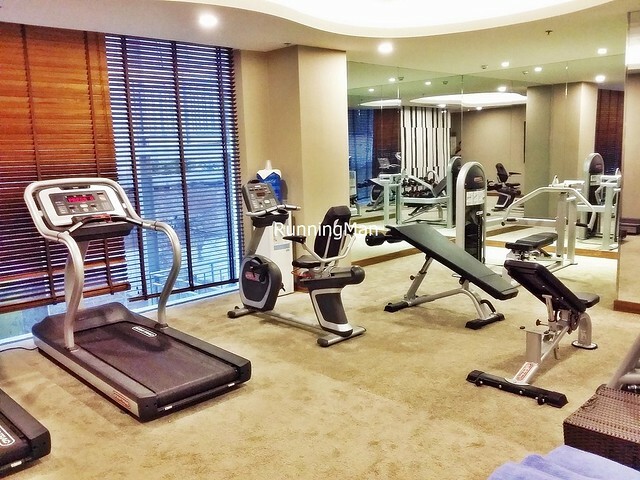 The conference rooms are well equipped and can seat quite a lot of people, while the gymnasium boasts a good variety of work out equipment. The swimming pool is rather small, but offers a nice view of the surrounding area. They even have karaoke rooms in the basement! 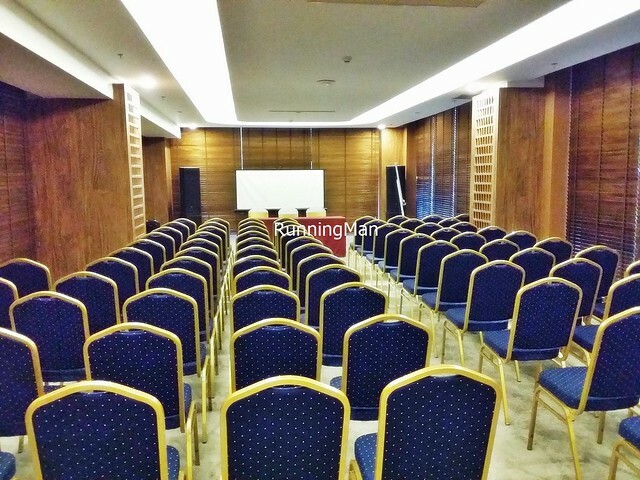 Overall, Muong Thanh Saigon Hotel has decent facilities, and the excellent location means it's a hotel of choice, nearly always fully booked at the moment. Attended with representatives from Come Let’s Eat Initiative, Embassy of the Philippines in Singapore, Burrple Singapore, and The 4 Moose. Budget about SGD $19 ++ per person. 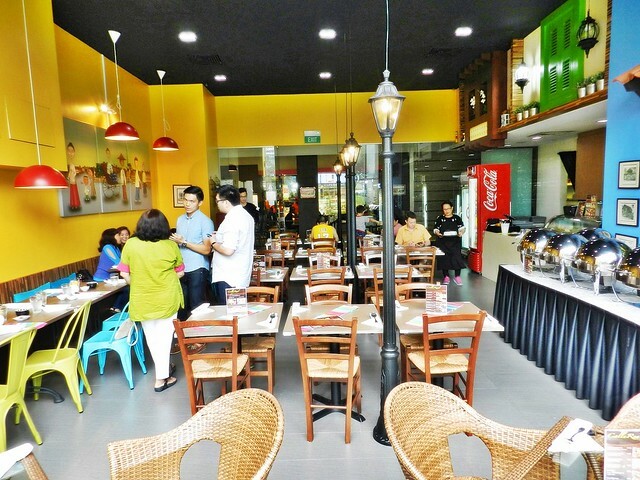 While Cafe Calle Real has only been in their current location for about 1 year, their history actually stretches back to July 2006, having moved from Lucky Plaza, to Joo Chiat, before finally settling here in UE BizHub East. 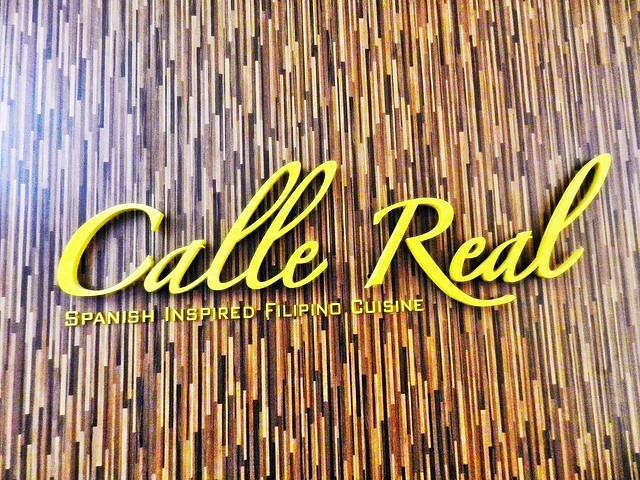 Cafe Calle Real is known for its modern Filipino cuisine; while predominantly Filipino, it also incorporates elements of Spanish and Chinese cuisine. We attended as part of the Come Let’s Eat Initiative, which strives to promote a more harmonious society in Singapore, by connecting Singaporeans with foreign cultures, through a shared food experience. 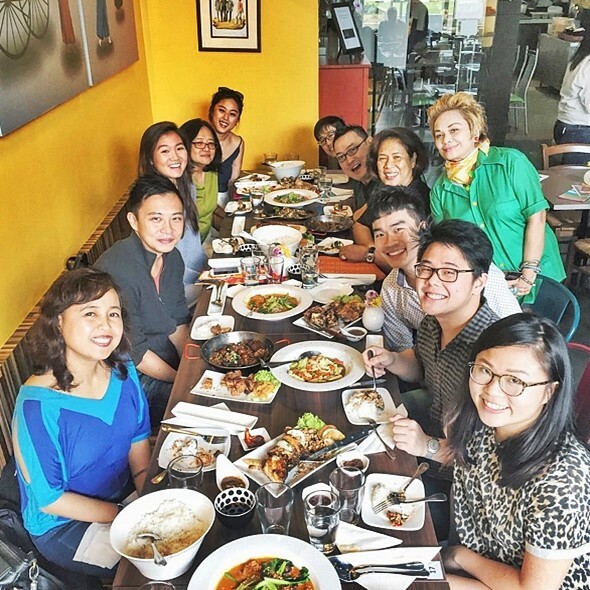 In this tasting session at Cafe Calle Real, we were fortunate to be hosted by representatives from the Embassy of the Philippines in Singapore, along with Head Chef Joefre, Chef Rose, and celebrity actress, singer, and fashion designer Pamela Wildheart. 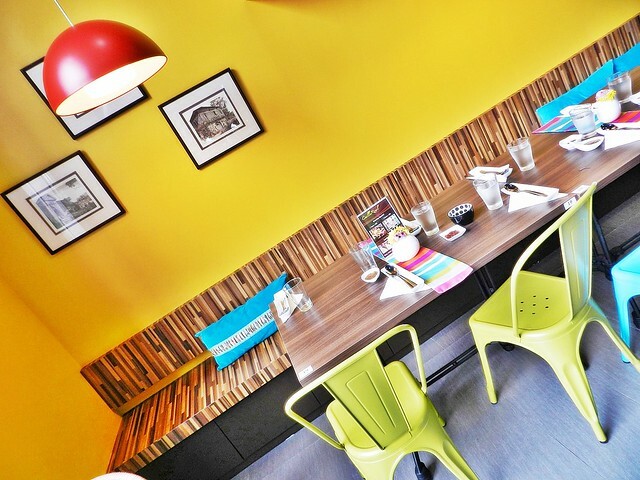 Ambience at Cafe Calle Real is colourful and cheerful. Sturdy wooden and metal furnishings, laid out in communal dining style, are in vibrant summer colours, without being garish or tacky. The ample natural light makes the place brightly lit, and the atmosphere can be noisy and bustling with laughter during peak periods. 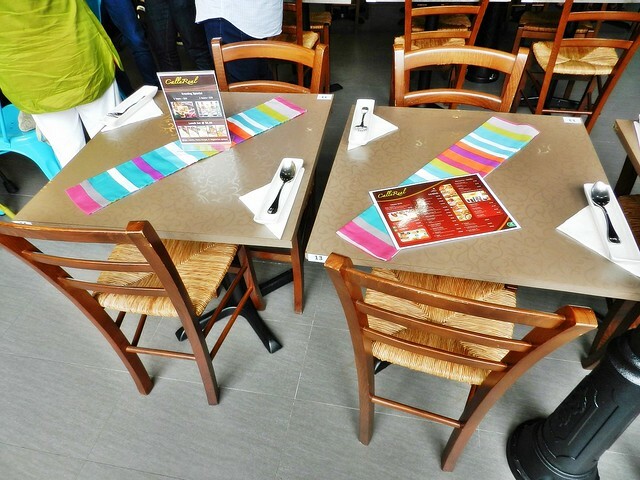 Cafe Calle Real can even set up a buffet line to accomodate events! Service at Cafe Calle Real is good. 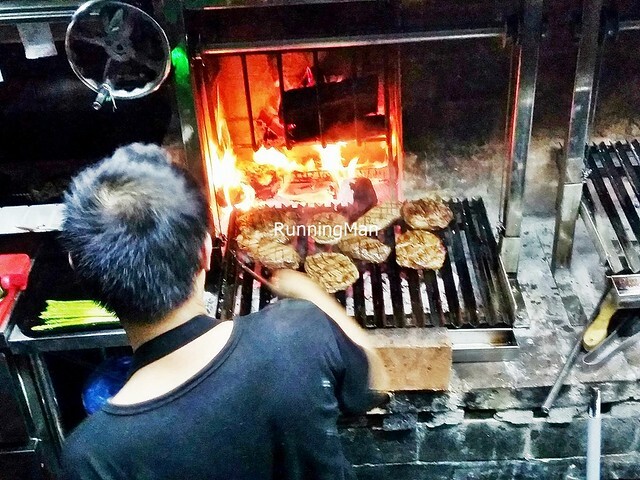 Staff are friendly, polite, and welcoming, greetings diners and having them quickly seated. 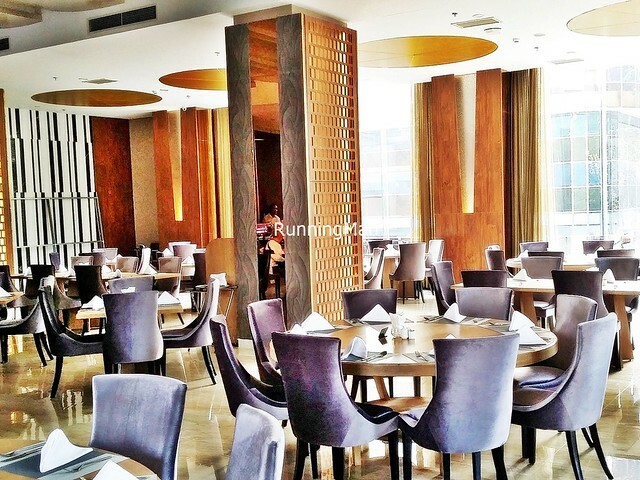 They display good product knowledge, able to describe how dishes are created. Food is served incredibly quickly, and looking at a full table packed with delicious food is just delightful. I like that staff come around occasionally to check if they're able to clear empty / dirty plates, and will also accede to requests for a change of serving plates. 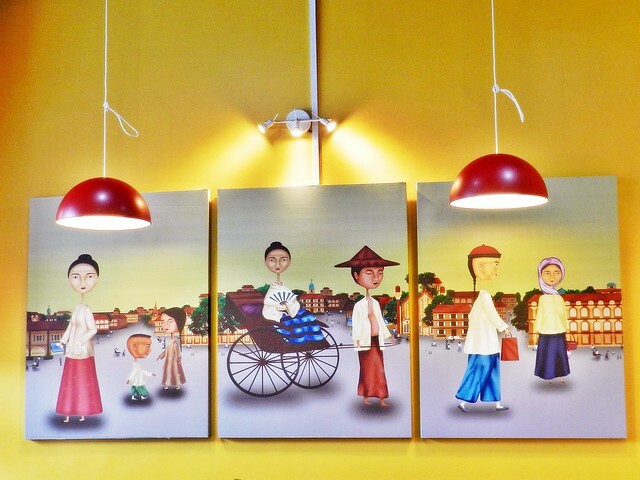 Food at Cafe Calle Real is modern Filipino cuisine. Having previously visited the Philippines, and tasted the cuisines of both Manila and Cebu, I notice Filipinos prefer strong flavours, centered around savoury, sweet, salty, and sour, with an emphasis on contrast of flavours and counterpoints. At Cafe Calle Real, dishes taste less intense in flavour than normal, making it enjoyable for a wider variety of people. In terms of execution, small elements of Chinese, Indian, or Spanish cuisine have been incorporated into the traditional Filipino dishes. Portions are designed for communal dining, much too large for an individual, and sharing between at least 2 or 3 people is best. 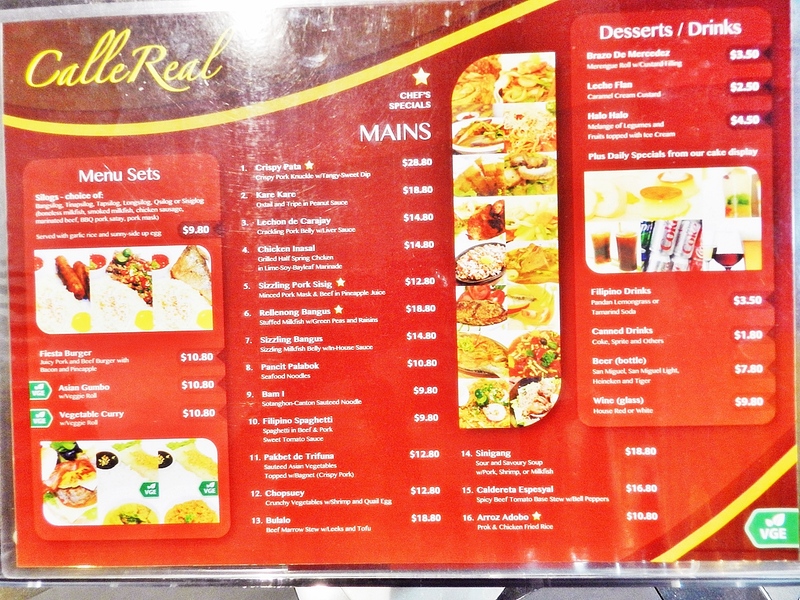 Prices are comparable to other cafes, budget about SGD $19 per person for a meal here. 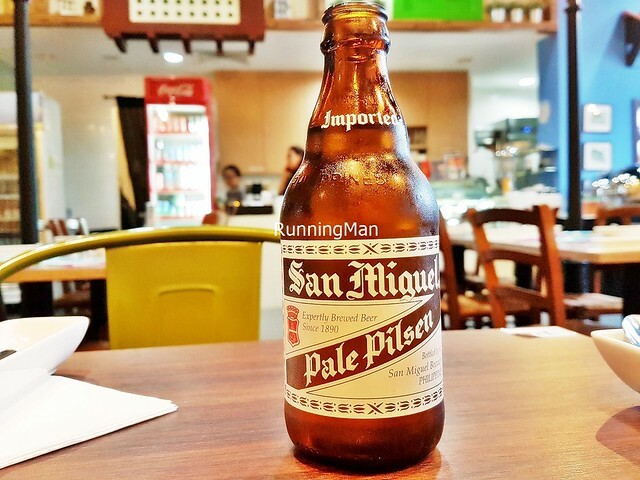 The Beer San Miguel Pale Pilsen (SGD $7.80) is a common Filipino alcoholic beverage. It has a bright, straw golden colour with a medium-thick foam head; a smooth, crisp, refreshing body with tastes of malt, grain, corn, and lemon. Pleasant and light drink with little bitterness and soft carbonation. 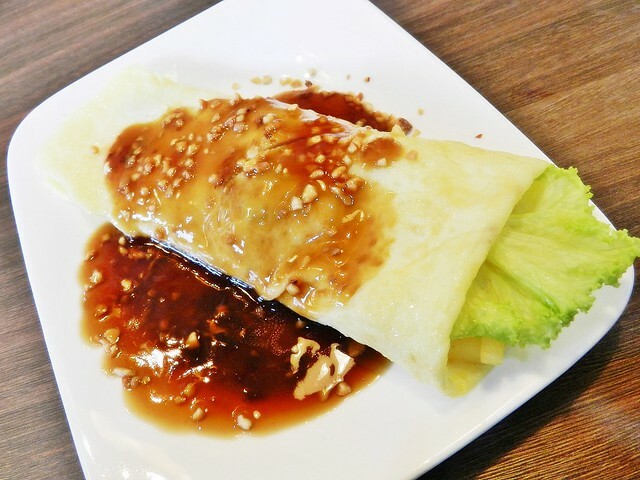 Inspired by Chinese cuisine, the Lumpiang Sariwah (SGD $4.80) is essentially a vegetarian spring roll. A thin egg roll is stuffed with strips of potato, turnip, string beans, chickpeas (instead of mung beans), and lettuce (a modern ingredient). What makes the dish taste great is the thick, sweet savoury sauce, made from brown sugar, soy sauce, chicken stock, garlic, and crushed peanuts. The contrast of fresh, bright flavours from the spring roll, and the deep, robust flavour of the sauce, makes this dish memorable. 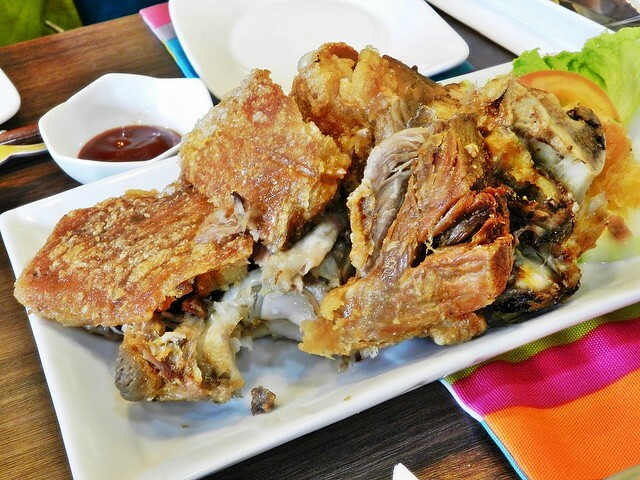 Loved the Lechon De Carajay (SGD $14.80), more commonly known as Lechon Kawali, with its extremely crispy skin and moist, tender meat! Chef says the pork is air-dried for 3 hours, smoked for 1 hour, then roasted for another 2 hours. This results in the skin being taunt, cracking beautifully, yet retains moisture in the meat, making it soft and succulent. Paired with a robust sweet liver sauce, this was easily among the best dishes I tried here. Highly recommended! 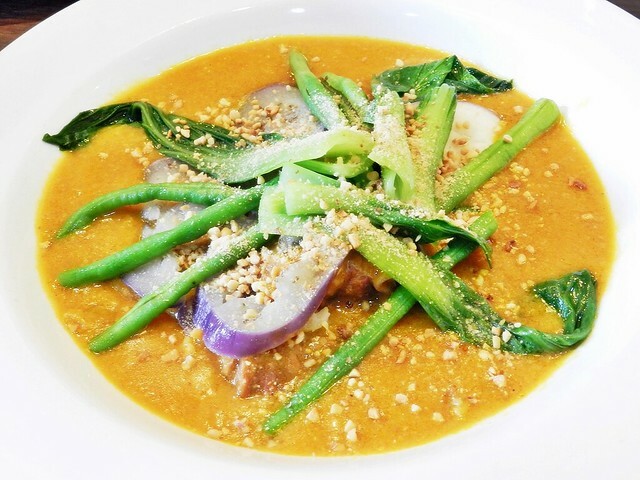 The Kare-Kare (SGD $18.80) is a type of Filipino stew, made of oxtail and beef stomach, along with eggplant / aubergine, string beans, and kai-lan / Chinese kale / Chinese broccoli (a modern ingredient). A thick, savoury sweet peanut sauce is liberally poured over the top, making this dish rich and flavourful! I find the peanut sauce to be milder in flavour than the traditional versions I've tasted, yet the lightness is rather appealing, making it easy to eat. Paired with an intense dried shrimp paste, which you mix in yourself, this creates a new depth of flavour for the dish. Excellent! 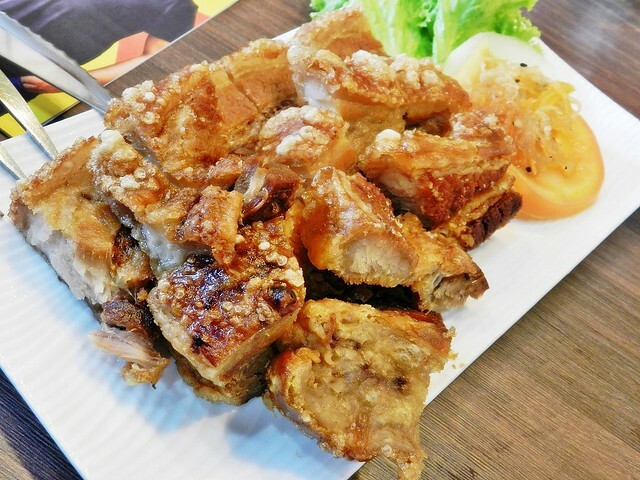 The Crispy Pata (SGD $28.80) is a famous Filipino dish of deep fried pork knuckle. Incredibly decadent, the meat of the pork is rendered tender by slow simmering in water. The skin is then rubbed with spices and seasoning, including vinegar, and then deep fried. The version here has very crisp skin, with a large amount of fat, but I find the meat isn't as tender as it should be, still being rather tough in texture. This dish is commonly served with a dipping sauce made from soy sauce, vinegar, brown sugar, and chopped onions, and goes great with beer! 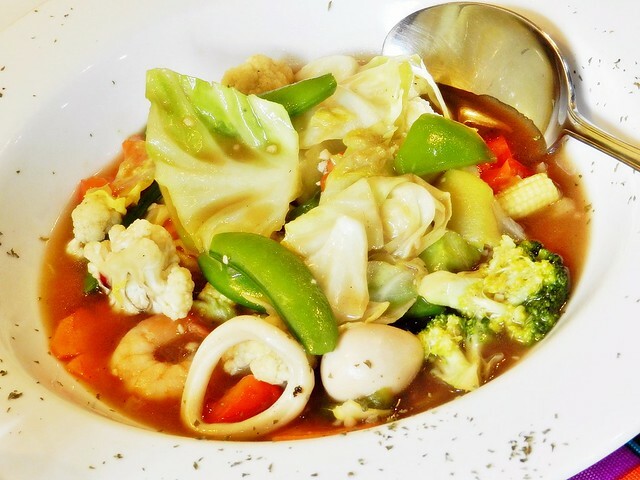 The Chopsuey (SGD $12.80) here features a decent mix of vegetables, including cabbage, snow peas, broccoli, cauliflower, carrots, baby corn, bell peppers / capsicums, button mushrooms, along with squid rings and deshelled prawns. The entire dish is a modern interpretation, as our Filipino hosts tell us snow peas, broccoli, and cauliflower are considered luxury vegetables in the Philippines. Also, the dish has been cooked till the vegetables are soft and tender, which is how the Chinese prefer it, but the Filipino people actually prefer the vegetables to be firm and crunchy in texture. Still, it's a rather tasty dish. The Rellenong Bangus (SGD $18.80) was a standout dish, among the better dishes we tried here. 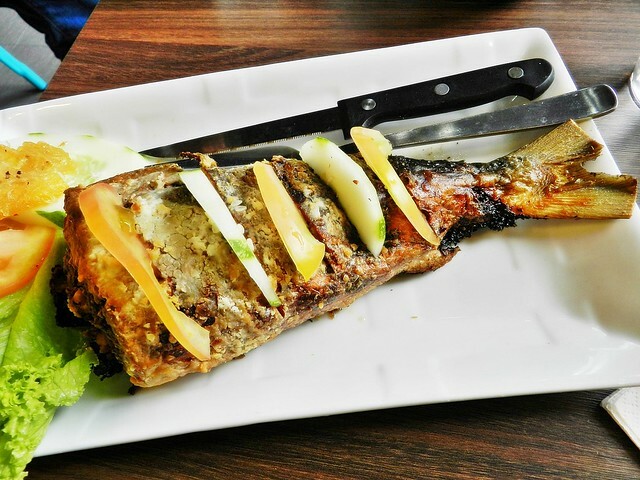 A medium sized milkfish, considered the national fish of the Philippines, is carefully deboned completely. 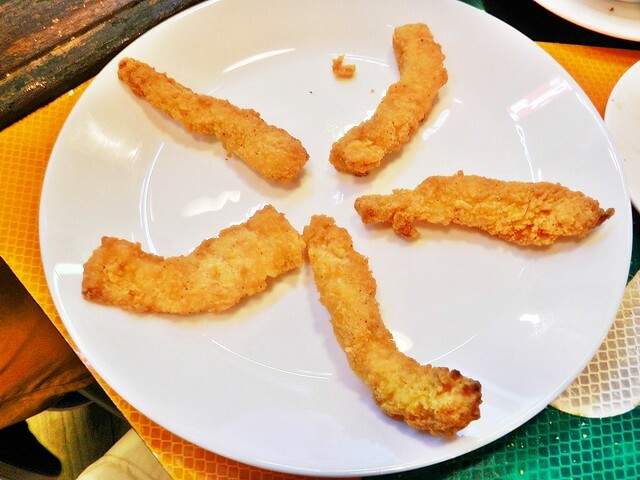 The mild, gentle tasting fish flesh is mixed with green peas and raisins, then carefully laid back to resemble a whole fish, before being deep fried. The result is crisp, savoury fish skin, with aromatic, savoury salty sweet fish meat, milky and grainy in texture. Succulent and delicious, totally unstoppable. Highly recommended! 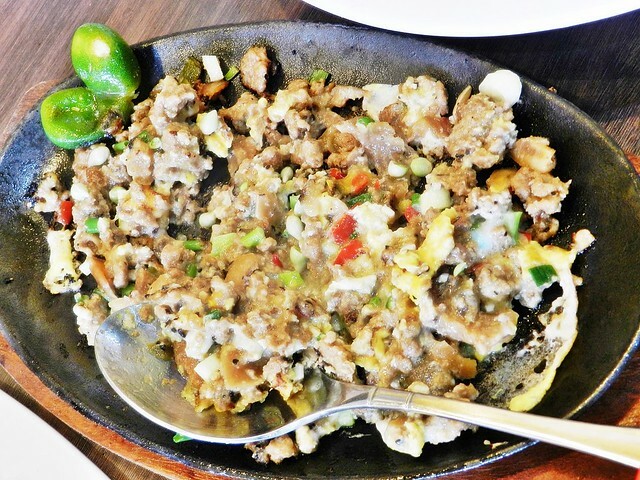 It's said, "Sell the sizzle", and that's completely true with the Sizzling Pork Sisig (SGD $12.80). A noisy, sizzling hot plate, filled with egg, minced pork, minced beef, onions, bell peppers / capsicums, coated in pineapple juice, is mixed at the table, releasing a fragrant aroma of meat. Totally appetizing, this savoury salty sweet dish is best paired with rice, and eaten when piping hot. Pure comfort food at its best. Good! The Sinigang (SGD $18.80) here is pretty good, sticking close to the traditional version. 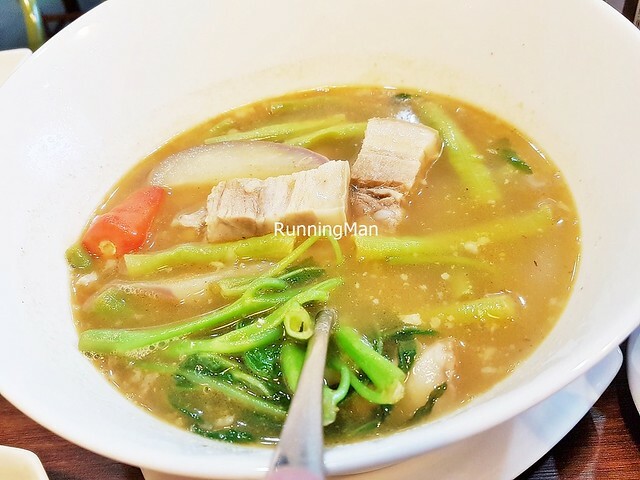 Featuring thick, fatty, meaty slices of pork belly, along with tender string beans, tomatoes, eggplant / aubergine, kang kong / water spinach leaves, and slices of chili, in a sour savoury, thin and clear soup / broth that is big on flavour. The sourness makes it rather addictive! 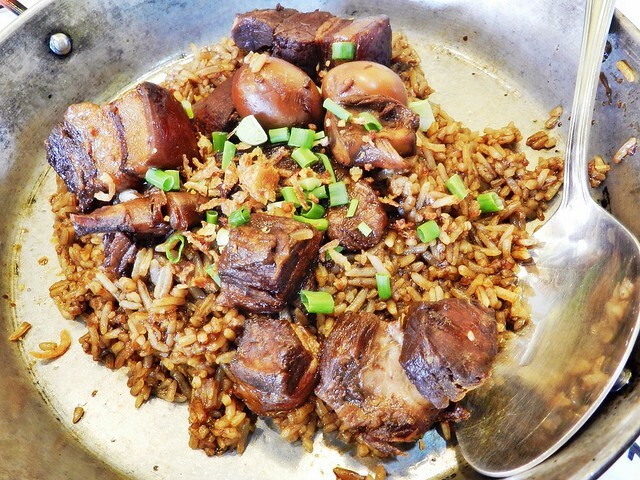 The Arroz Adobo (SGD $10.80) is an example of Fusion Spanish Filipino cuisine. Served in a paella pan, the savoury fried rice is topped with tender chunks of fatty pork belly and chicken meat, done adobo style, which is a process of slowly cooked meat which has been marinated in vinegar, crushed garlic, bay leaves, soy sauce, and pepper. 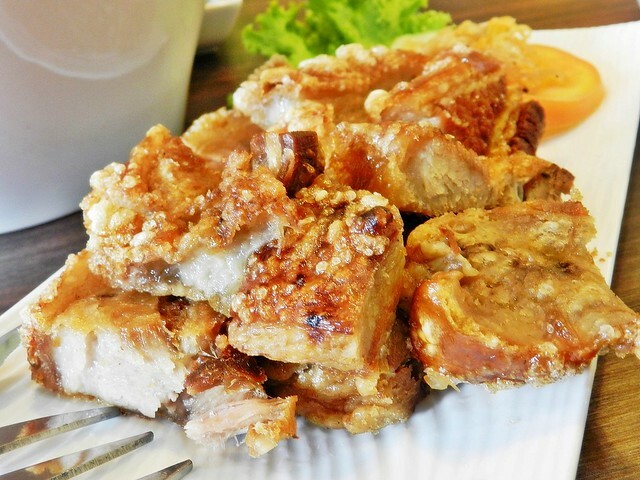 The result is pork and chicken which is savoury salty in taste, with incredibly tender, fall apart texture. While I like this dish, it falls short because it lacks the lovely crisp, burnt bits of rice which usually stick to the sides of the pan. 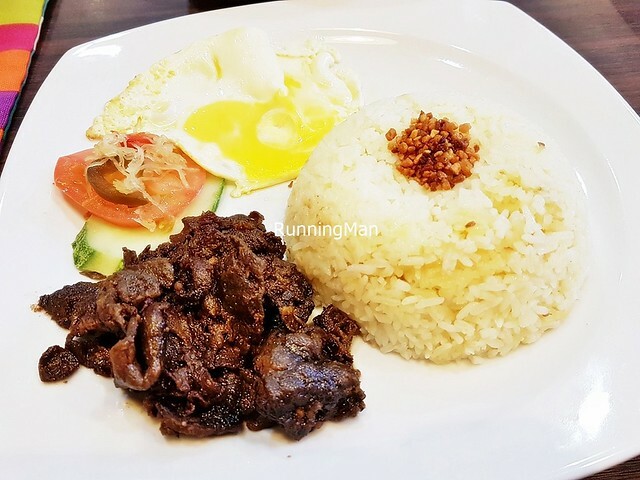 A good value for money lunch meal, the Tapsilog (SGD $9.80) features the classic Filipino savoury tapa / grilled cured beef, a fragrant garlic fried rice, a sunny side up egg, atchara / pickled papaya strips, cucumber, tomato, and vinegar as a condiment. A hearty, working-person meal, quick and filling! 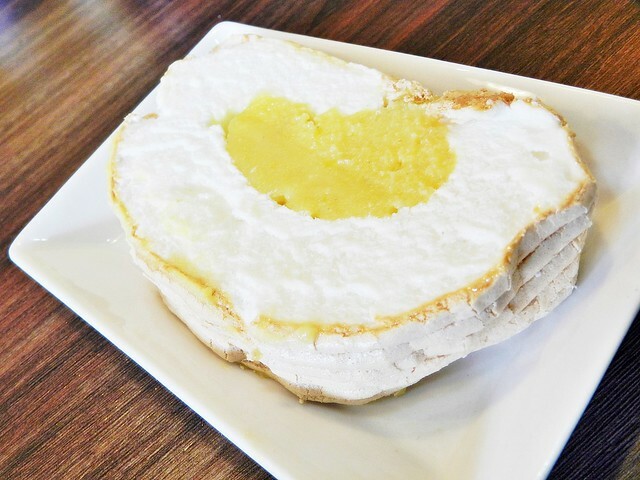 The Brazo De Mercedez (SGD $3.50) is essentially a rolled meringue cake with a custard centre. The outer layer is a soft meringue cream made from pure egg whites, while the inner center is a soft custard made from pure egg yolks. This rich dessert cake is soft and sticky in texture, and intensely sweet and eggy in taste, totally decadent. Our Filipino hosts tell us the best time to eat this is not when it's freshly made, rather, it should be left to set for 1 or 2 days, until tiny beads of moisture have formed on the exterior. The version here is baked in-house, and is authentic and delicious! 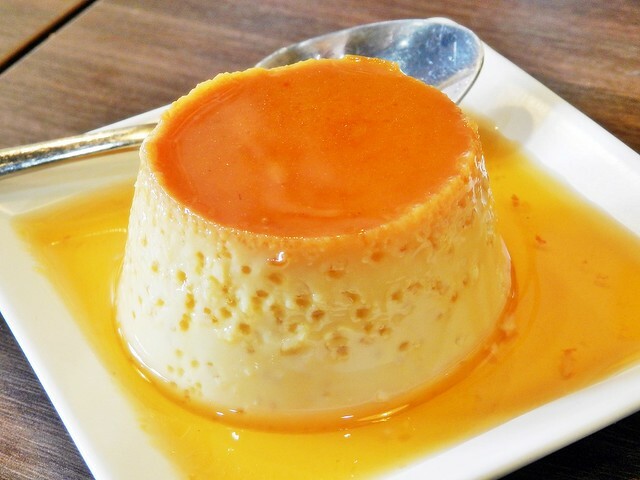 The Leche Flan (SGD $2.50) is essentially a Creme Caramel, a soft custard pudding dessert coated with a sticky sweet caramel sauce. The Filipino people prefer this to be denser in texture and sweeter in taste, made with condensed milk and egg yolks, as opposed to the European style which is usually lighter and more airy in texture. Overall, Cafe Calle Real offers a good dining experience, with comfortable ambience, friendly service, and decent tasting food. While not completely authentic, the food at Cafe Calle Real is a great introductory experience for non-Filipinos, and prices are affordable enough for everyday communal dining. Filipinos themselves will still enjoy the modern interpretation of dishes at Cafe Calle Real, as they strike a nice balance between the familiar and the new. I will return to Cafe Calle Real for more!